Those who smoke and drink heavily are prone to stomach ulcer. According to Dr. Oludara “smoking cigarettes and drinking alcohol also can make one more likely to get ulcers. 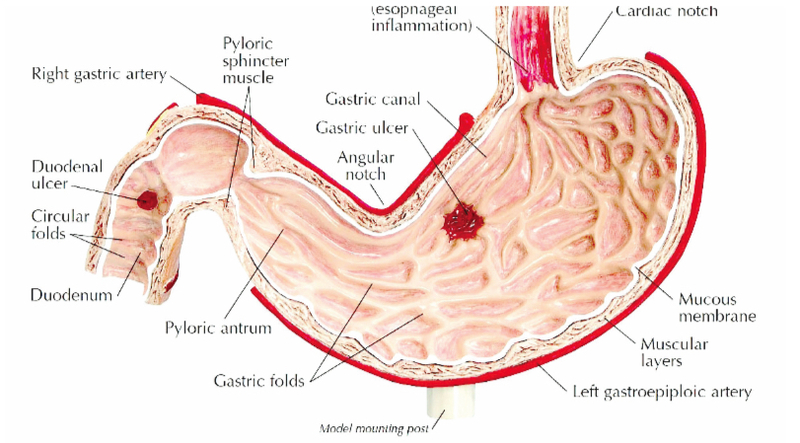 Mrs. Theresa Umoru has been managing gastric ulcer, commonly called stomach ulcer, for about 17 years. Up till this moment, she cannot firmly say how she developed the ailment, even as she still seeks a lasting solution to it. The mother of three had, for years, mistaken the disease for a mere stomach upset until a proper diagnosis was carried out while she was in the higher institution as a spinster. Before then, she confessed to have applied different medications – orthodox and unconventional. The more she grew older, the more her stomach was intermittently plunged into acute discomfort. Stomach ulcers, a type of peptic ulcer disease, are painful sores in the stomach lining. Peptic ulcers affect both the stomach and small intestines. Simply put, stomach ulcers occur when the thick layer of mucus that protects the stomach from digestive juices is reduced. This allows the digestive acids to eat away at the tissues that line the stomach, causing an ulcer. The patient might have no symptoms, or he or she may simply feel discomfort or burning pain. Though curable or could be managed for a lifetime, as the case may be, experts have also warned that peptic ulcers could lead to internal bleeding, which sometimes require blood transfusions in the hospital. And if not promptly and professionally handled, chronic stomach ulcer could result in death. In a chat with Daily Sun, a general practitioner based in Lagos, Oludara David, said taking preventive measures was more economical in avoiding and overcoming stomach ulcer. He said ignorance was one of the reasons many people have been badly infected with the disease, revealing that one out of 10 people one form of stomach ulcer or another. The medical expert said one could develop stomach ulcer at any age, but one’s chances go up, as one gets older. This may be because arthritis is prevalent in the elderly and alleviating arthritis pain could mean taking daily doses of aspirin or ibuprofen. “Another contributing factor may be that with advancing age the pylorus (the valve between the stomach and duodenum) relaxes and allows excess bile (a compound produced in the liver to aid in digestion) to seep up into the stomach and erode the stomach lining,” he said. He said there were two known types of peptic ulcer disease: Gastric ulcer, which strikes on the stomach lining, while duo- denal ulcer appears at the top end of the small intestine – an organ that digests and absorbs much of the food one eats. The latter is more common than the former. Until about 30 years ago, the general belief was that ulcers form mainly as a result of stress, a genetic predisposition to excessive stomach acid secretion and poor lifestyle habits (including overindulging in rich and fatty foods, alcohol, caffeine, and tobacco). It was believed that such influences contribute to a build-up of stomach acids that erode the protective lining of the stomach, duodenum or oesophagus. Recent studies have, however, countered the age long belief and revealed that while excessive stomach acid secretion certainly plays a role in the development of ulcers, a relatively recent theory holds that bacterial infection is the primary cause of peptic ulcers. Indeed, research conducted since the mid-1980s has shown that the bacterium Helicobacter pylori (H. pylori) is present in more than 90 percent of duodenal ulcers and about 80 percent of stomach ulcers. However, more recent figures indicate those percentages are declining. Ulcers form when digestive juices damage the walls of the stomach or small intestine. If the mucus layer gets too thin or your stomach makes too much acid, your gut will feel it. Oludara said for no known reason, people with type A blood are more likely to develop cancerous stomach ulcers. Also, he said duodenal ulcers tend to appear in people with type O blood, possibly because they do not produce the substance on the surface of blood cells that may protect the lining of the duodenum. Some other causes of stomach ulcer include bacteria and use of painkillers, among others. Bacteria. It is called Helicobacter pylori (H. pylori), and as many as one out of two persons carry it. Most people infected with H. pylori do not get ulcers. But in others, it can raise the amount of acid, break down the protective mucus layer, and irritate the digestive tract. Experts aren’t sure how H. pylori infection spreads. They think it may pass from person to person through close contact, like kissing. You may also get it from unclean food and water. Certain pain relievers. According to a general medical practitioner, if you have been taking aspirin often and for a long time, you are predisposed to stomach ulcers. The same is true for other nonsteroidal anti-inflammatory drugs (NSAIDs). They include Ibuprofen and Naproxen. He added that NSAIDs block the body from making a chemical that helps protect the inner walls of the stomach and small intestine from stomach acid. Anybody suffering from peptic ulcer is most likely to feel a burning pain or discomfort between his or her belly button and breastbone. He or she might especially notice it on an empty stomach – such as between meals or at night. The pain may stop for a little while if you eat or take an antacid, but then return. The pain can last for a few minutes or a few hours, and may come and go for many days or weeks. Other symptoms may include: Bloated feeling, burping, lack of appetite or weight loss, nausea, bloody or dark poop and vomiting, weakness, trouble breathing, sudden and sharp pain in your abdomen that doesn’t go away easily. However, Oludara noted that small ulcers might not cause any symptoms, but insisted that one should see a doctor when any of the aforementioned signs was suspected. Doctors often ask about the patient’s symptoms, whether he takes NSAIDs and other drugs, as well as running his medical history. He could also check his patient for bloating in the belly and pain. “The only way your doctor can tell for sure if you have an ulcer is to look. He may use a series of X-rays or a test called an endoscopy. This test allows the expert to pass a thin, bendy tube down your throat and into your stomach and small intestine. The tube has a camera at the end, so he can check the lining for ulcers. The doctor may also take a small piece of the lining to test for H. pylori. Blood, breath, and stool sample tests also can screen for the bacteria,” Dr. Oludara said. It is instructive to note that some peptic ulcers heal on their own. However, there is a warning that if you don’t treat them when discovered, the ulcers tend to come back. They can erode the blood vessel wall in your stomach or small intestine. The ulcers also can eat a hole through the lining and get infected. Or they can cause swelling, which may block food from moving from your stomach into your small intestine. If H. pylori are the culprit, your doctor H may prescribe a mix of antibiotics to kill it. If aspirin and other NSAIDs are behind the ulcer, you may need to cut down on them, stop taking them altogether or switch to another pain reliever. The medics may also prescribe antacids to fight stomach acid or give medicine to lessen the acid the body makes. Some prescribed drugs can help protect the lining of the stomach or small intestine so the ulcer can heal. Oludara, however, insisted that peptic ulcers were relatively easy to treat, stating that in many cases they are cured with antibiotics, antacids, and other drugs that reduce the amount of acid produced by the stomach. There are also a variety of self-help and alternative treatments that can aid in relieving pain. “Still, the dangers associated with peptic ulcers – such as anemia, profuse bleeding, and stomach cancer – are serious; so ulcers should always be monitored by your doctor,” he said. Nutritionists have said that while the foods you eat won’t cause or cure a stomach ulcer, eating a healthful diet can benefit your intestinal tract and overall health. In general, it’s a good idea to eat a diet with lots of fruits, vegetables, and fibber. Also, there are foods that may possibly play a role in eliminating H. pylori or boost the body’s own healthy bacteria, including Broccoli, cauliflower, cabbage, and radishes, leafy greens, such as spinach and kale. Others are probiotic-rich foods, such as sauerkraut, yogurt (especially with lactobacillus and Sacharomyces), apples, blueberries, raspberries, strawberries, and blackberries and olive oil. Your doctor may also have suggestions for things you can do at home to relieve discomfort from your ulcer. You can also talk to your doctor about these natural and home remedies for ulcers. If you think you have a stomach ulcer, call your doctor. It is imperative to get a stomach ulcer taken care of because without treatment, ulcers and H. pylori can cause bleeding from the ulcer site that can become life-threatening; penetration, which occurs when the ulcer goes through the wall of the digestive tract and into another organ, such as the pancreas. It can also cause perforation, which arises when the ulcer creates a hole in the wall of the digestive tract, as well as obstruction (blockage in the digestive tract, which is due to swelling of inflamed tissues. It can also result in stomach cancer, which is up to six times more likely in people who have H. pylori infections compared to those who don’t.